I have mentioned before that I’m taking part in the Sustainable Eats year-long Urban farming challenge. It is true that I am a city girl, also true that I don’t much like getting dirty! 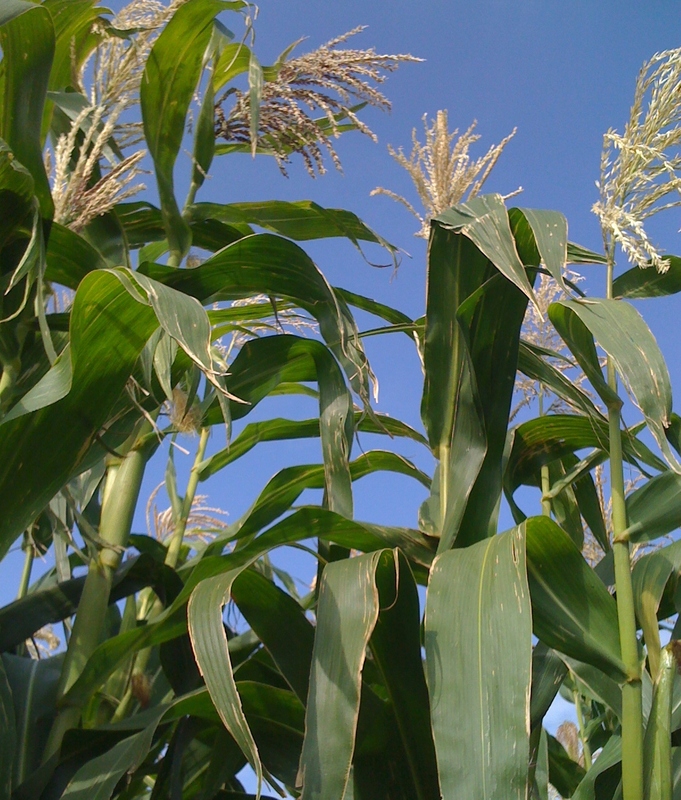 Having said that there is a part of me that loves the idea of living in the open and growing my own food. Maybe a future life change but for now I make do with what I can grow in my tiny city garden and with the very generous crops that come from my Mother in law’s allotment. The challenge for August is food preservation. I’ve preserved lots, I made Peach Pie conserve also courgette relish, dill pickles, fig jam and more. 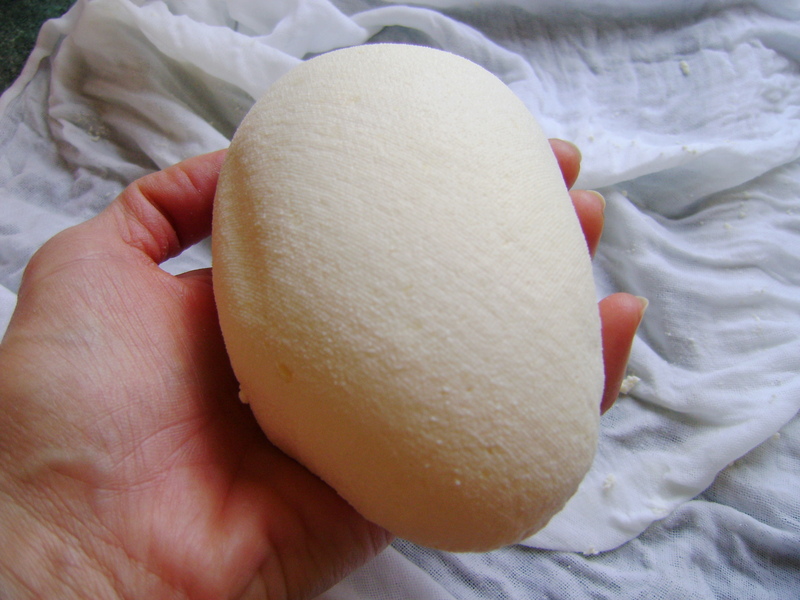 There were further challenges within food preserving such as fermentation. Lacto-fermentation is meant to have many health benefits so this is something that interests me but I have no experience of it. Last year I made Winnie’s Pickled Cukes using lacto-fermentation and they were great so I knew where to head when I decided I would like to give Kimchi a try. 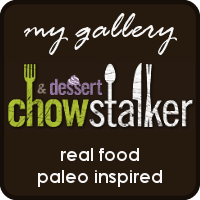 Winnie’s blog Healthy Green Kitchen is one of my favourite blogs, full of healthy, delicious recipes and the photography is stunning! I chose to make the cucumber kimchi as I had a bunch of cucumbers freshly picked that morning. It’s really easy to make and no cooking is involved. I found the Cucumber kimchi to be incredibly flavourful, its tangy, sweet and a little sharp. I’ve been using it as a vegetable side dish and have really enjoyed it, I can not deny that I have also eaten forkfuls of t right from the jar! I didn’t have tamari or liquid aminos so used 3/4 tbsp of soy sauce instead. I used 1 tbsp of garlic rather than 2. Its summer, although apart from a few nice days one would think that Summer passed us right by this year! 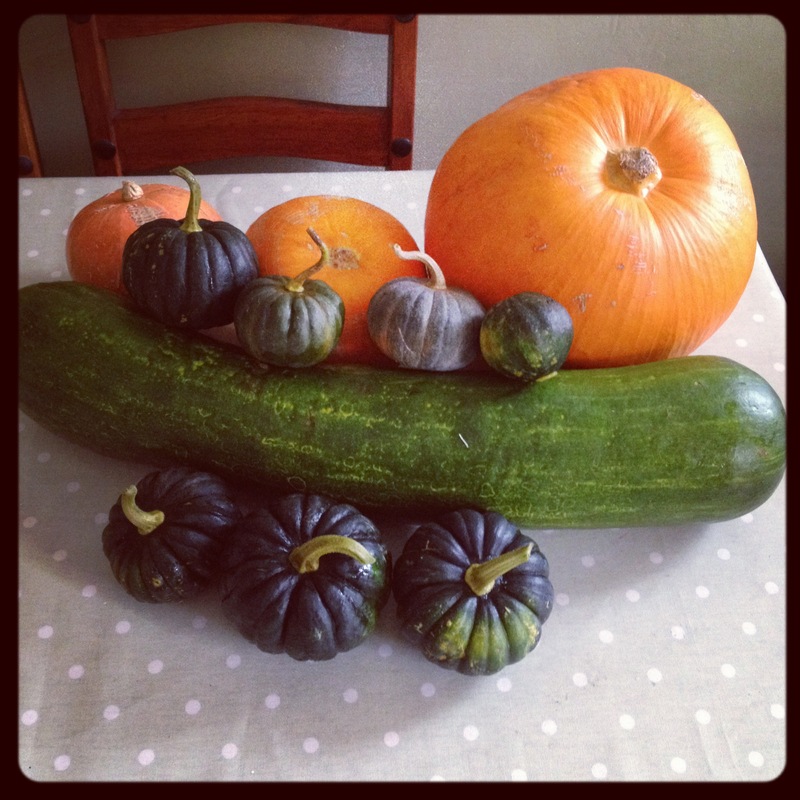 But Summer it is and the courgettes don’t seem to mind the weather, they still keep coming! I’ve mentioned before that my Mother in law has an allotment and passes her produce onto me. Courgettes seem to be the most prolific crop, pounds and pounds of them come my way. This year trying to keep the courgette situation under control I suggested that we try yellow courgettes, just yellow ones and only 2 plants. When we got back from our recent holiday it was to find bags of home-grown vegetables waiting for us, in the bags I found a couple of yellow courgettes and surprisingly even more green ones! I’m not sure when the green ones were planted or why they produce more than the intended yellow plants but once again I found myself up to my elbows in courgettes! 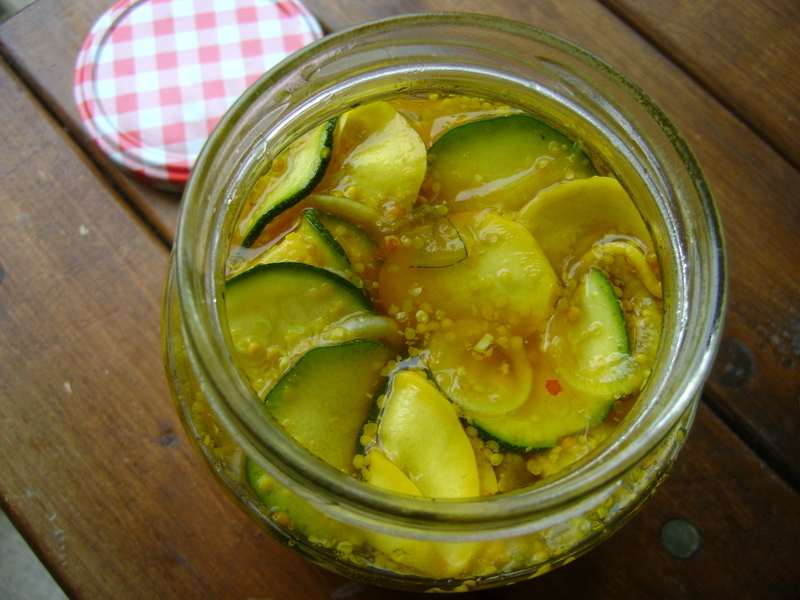 These pickles are one of the courgette/zucchini recipes I had bookmarked for the glut! I really wanted to make dill pickles with cucumbers this year but the cucumbers really did object to the Autumnal summer we’ve had, dying off after producing one mini cucumber each. When I came across this timely recipe I thought it would be a new way to use up some of my bounty, while perhaps satisfying my dill pickle craving. 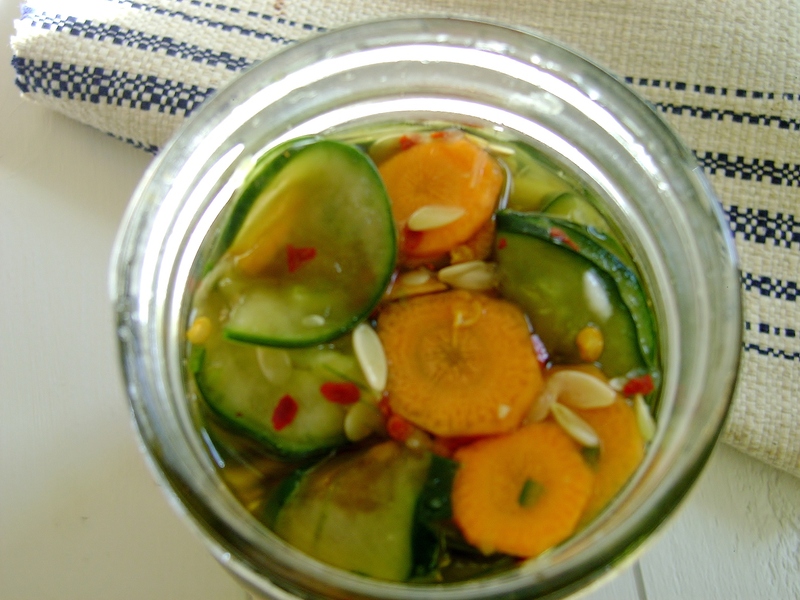 I really liked them, they are really easy to make and as they are refrigerator pickles they are really quick too. They have the right amount of sweet verses tart and I couldn’t help but add my own heat with some chilli flakes. This recipe links up nicely with the August challenge of the Sustainable Eats Urban Farm Challenge that Im taking part in. The challenge this month is food preservation. I was spoilt for choice as peaches are one of my favourite ingredients in the summer but finally decided to make this jam as my entry. I’ve seen Peach pie jam mentioned on twitter and as a lover of peach pie it was music to my taste buds! Its been on my “to make” list for some time. Peaches are a low pectin fruit and don’t set as well as other fruits so what was meant to be jam turned out to be a conserve, which is only a softer set jam and actually my preference. The only recipes I could find for Peach Pie Jam were American ones using pectin, it seems much more common to use pectin in the US. 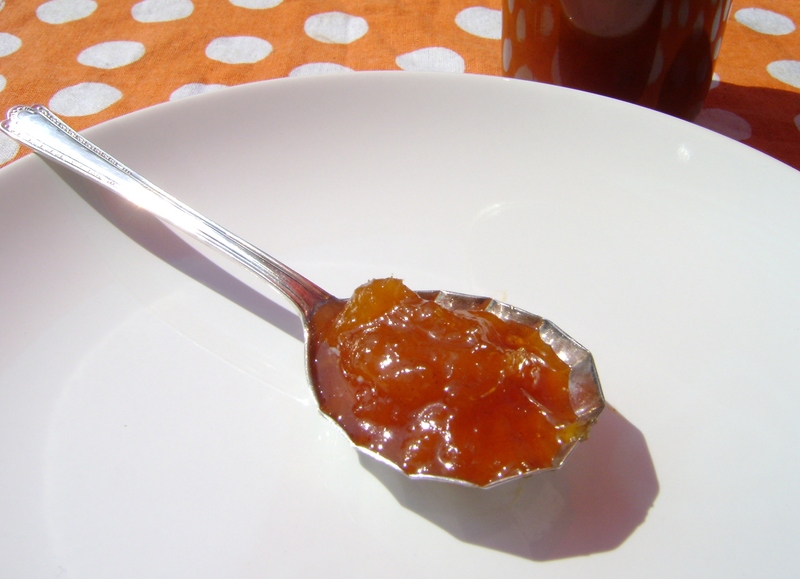 I prefer to use just fruit and sugar to make jams, relying on lemon juice for added pectin where necessary. You can buy “jam sugar” in the UK which has apple pectin added, I have used this in the past and it does give good results but as I now prefer to use unrefined sugar I don’t use the jam sugar any more. To make my version of Peach pie jam I just made peach jam and added cinnamon and nutmeg to make more of a pie flavour. It really does taste like peach pie filling! Serendipity was shining on me when I came across those peaches as this recipe will also tie in with the August Urban Farm challenge set this month by Marissa McClellan, author of the wonderful book Food In Jars. This book is full of wonderful recipes, in fact there is even a peach jam recipe, I will make that next time! 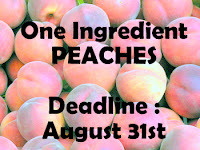 Peel the skin off the peaches by placing the peaches in a bowl of boiling water for a minute. Remove from the boiling water and the skins (most of them, there is always a stubborn one!) should slip right off. 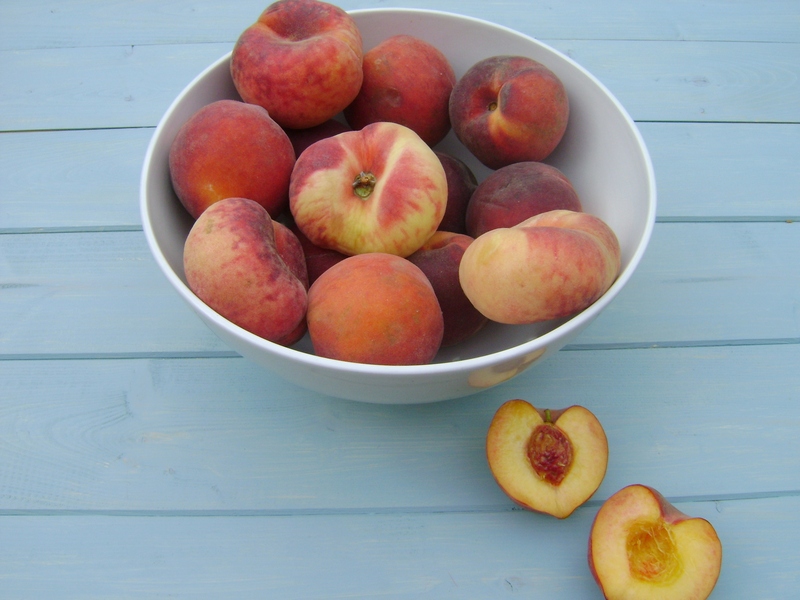 Remove peach pits, chop the peach flesh up and put in your jam pan along with the rest of the ingredients. Stir together well. Bring to a boil and allow to boil for 15- 25 minutes while stirring frequently. After 15 minutes check for setting point. The jam can take between 15- 25 minutes to reach setting point. 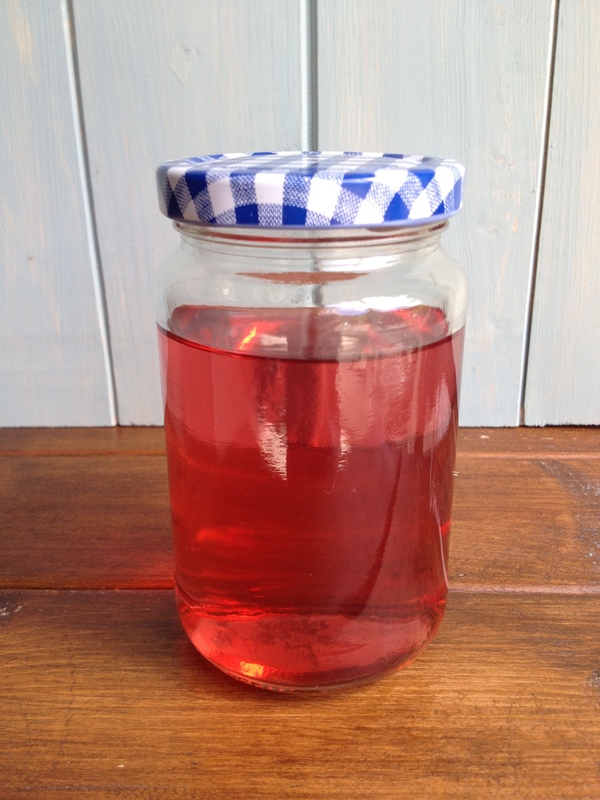 Once set remove from heat and put jam into sterilised jars. Then follow your usual canning procedure, or not as the case may be. I put my jars in boiling water for 10 minutes. A few weeks ago I wrote a post about foraging and mentioned that for the first time I had used chive flowers. I’ve grown chives for years so I’m not sure why I haven’t used the flowers before. I am in fact guilty of not remembering to use the chives very much either. As well as the chives I am currently growing oregano, thyme and sorrel, I forget to use them all! Getting around to remembering and using my herbs is something I’m trying to be better at. 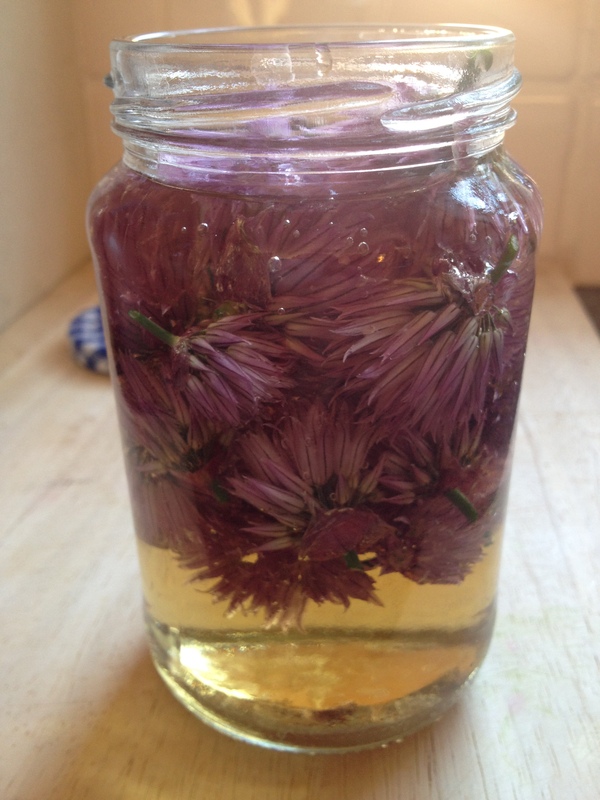 Around the same time as the foraging post I saw this post about making chive blossom vinegar by Marisa on her blog Food in Jars. With my chive flowers in bloom at the time I made it immediately and its been brewing in the cupboard since. 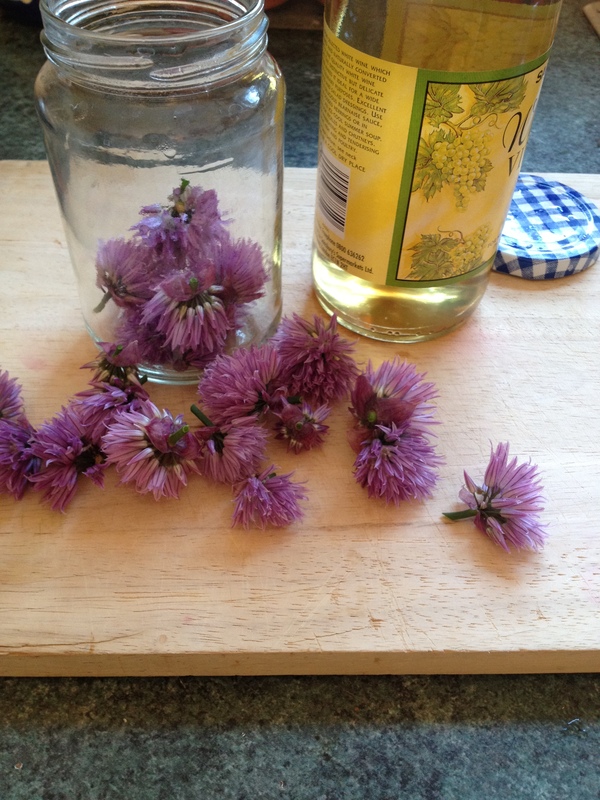 There may still be enough chive flowers left for you to have a try, it’s really quick and easy. I will be using the vinegar I made on summer salads. Coincidentally this project is perfect for the Urban farming challenge I’ve been taking part in this year, the challenge for June is all about botanicals, a new subject for me, I did mean to be more adventurous with the botanical theme and try to make my own lotion or balm, watch this space! When making the Chive Blossom Vinegar as Marisa says it’s so easy you don’t need a recipe. 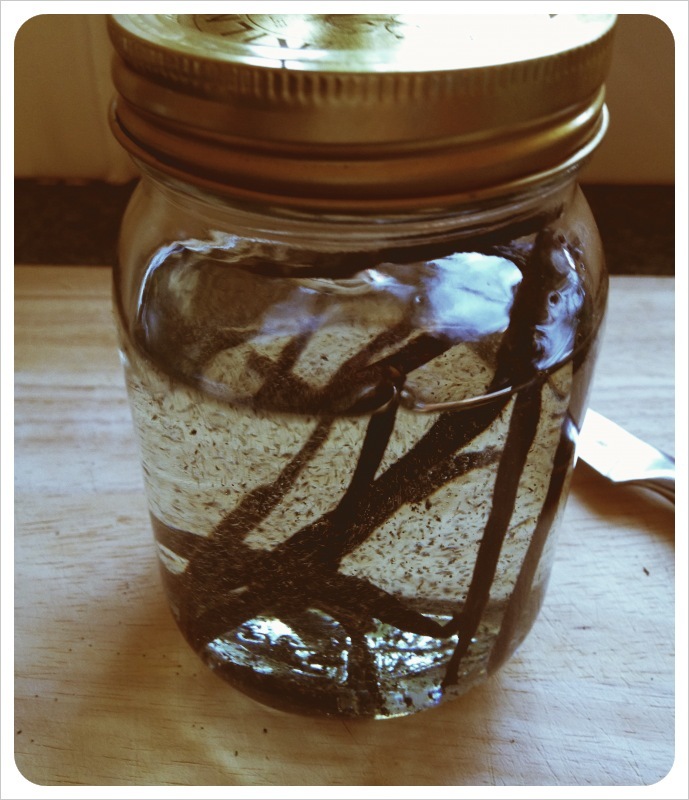 Not knowing how I would like it I only made a small jar, using white wine vinegar. The result is surprisingly pretty, the purple hue from the blossoms colour the vinegar a lovely shade of pink and leave a surprisingly strong onion flavour, for those in the UK the taste is reminiscent of pickled onion vinegar although milder than that. Heres what I did. I half filled a 1 lb jam jar with freshly picked blossoms. Rinse the blossoms and dry, in a salad spinner if you have one. Put the blossoms back in the jar and fill with vinegar, I used white wine vinegar. Seal jar and store in a dark place for up to 2 weeks, after this time strain the vinegar and store in your chosen jar/bottle. The finished vinegar, isn’t it pretty? 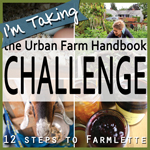 I am taking part in this years Urban Farm challenge, the challenge for May was foraging. Living in a city this is not a regular activity for me. I’ve picked wild blackberries but that’s about the extent of my foraging experience. The challenge here was to try dandelions, they are free and plentiful after all and I hear they are good for you. I must admit to dragging my heels on this challenge, nothing has ever made me want to try a dandelion! 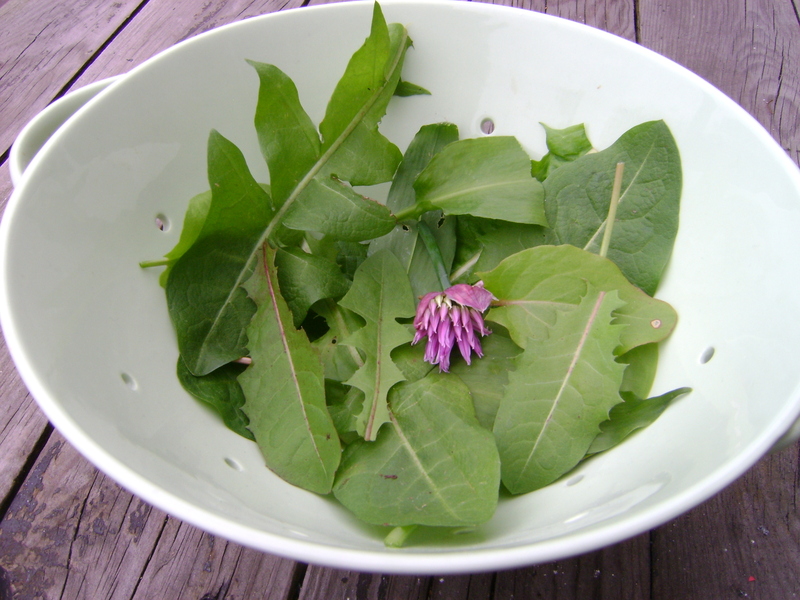 Cooking dandelions seems even less appealing to me so I decided to use the leaves in a salad. Lucky for me I have one rogue dandelion plant in my garden so I didn’t have to go far to forage! I tried to pick the smallest leaves as they are meant to be the least bitter. While in the garden I also picked some sorrel that I have growing and decided to use a chives flower in my salad, another first for me, I tend to just use the leaves of the chives and leave the flowers. By an amazing stroke of luck I also found some wild garlic growing next to the dandelion so that went into the salad as well! I added some mixed lettuce leaves and dressed it simply with olive oil and salt as I wanted to really taste the ingredients. 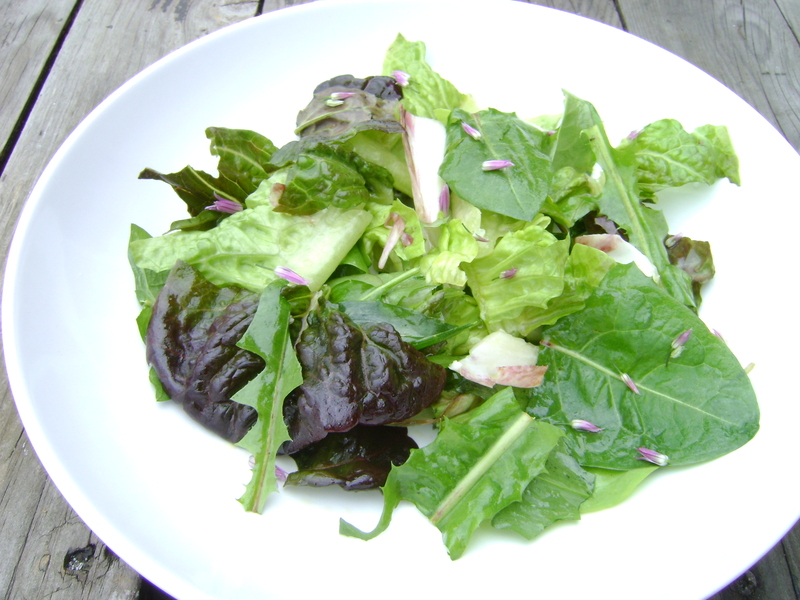 There is no recipe here as it really was just picking leaves, scattering some chives petals and dressing lightly. My verdict? Well I loved using the flower from the chives, amazing how strong the taste of onion was in those tiny purple tips. The wild garlic was wonderful, I wonder how long that has been growing under my nose? As for the dandelions, well I tried but they really were bitter and grassy! It was fun to take part and I wish Id had time to forage further, there were more foraging challenges but May escaped me and here we are already in June! I’m taking part in the Urban Farm Challenge, a year-long challenge with different monthly challenges all in the art of urban farming. April’s challenge was about gardening and the challenge was to sow seeds. 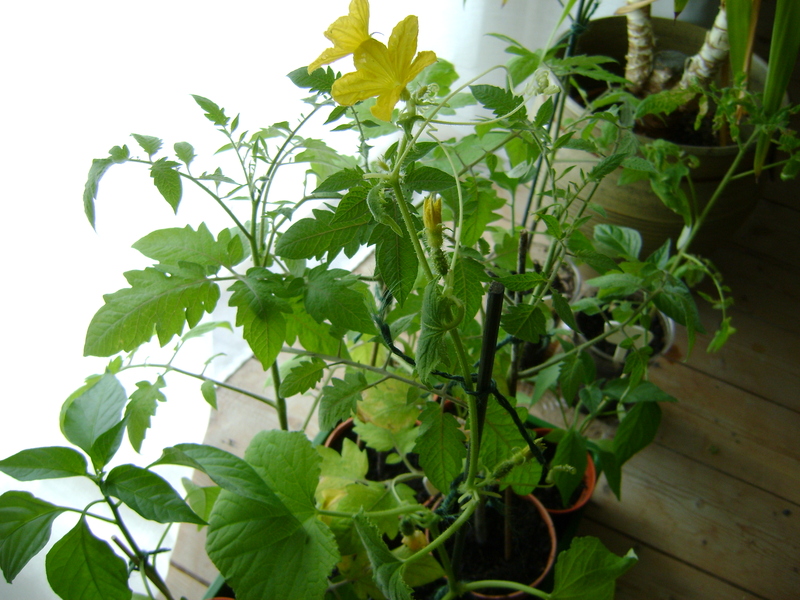 This is something I’ve done for years, ever since I had a garden, even if it’s just a couple of tomato plants I will always grow something from seed. In more recent years I’ve been extra lucky as my Mother in law has an allotment. Now my husband does not get his fear of all things green and healthy from nowhere, my Mother in law eats very few vegetables. In fact as green fingered as she is she passes most of her produce on to me as she just enjoys the growing of her lovely veg but does not care to eat it! Crazy huh? Erica at Northwest Edible Life blog encouraged us to not only grow seeds but to grow something that was new to us, I love that idea, its suits my personality so well! Perversely I seem unable to stick with vegetables that have been reliable but have to try new varieties every year, although that’s usually different varieties of the same vegetables so this year I have chosen some new vegetables to grow from seed. On the subject of choosing something new to me, well I have outdone myself and I am growing Collard greens, now they are something that you never, ever hear of here in the UK even though I managed to find the seeds from a UK company. Also new to me this year are chicory (endive in the US) and Kale, 2 varieties.Vegetables that I have grown before but chosen different varieties are yellow courgettes (zucchini in the US) and golden beets, long Naples pumpkins and Black futsu squash. 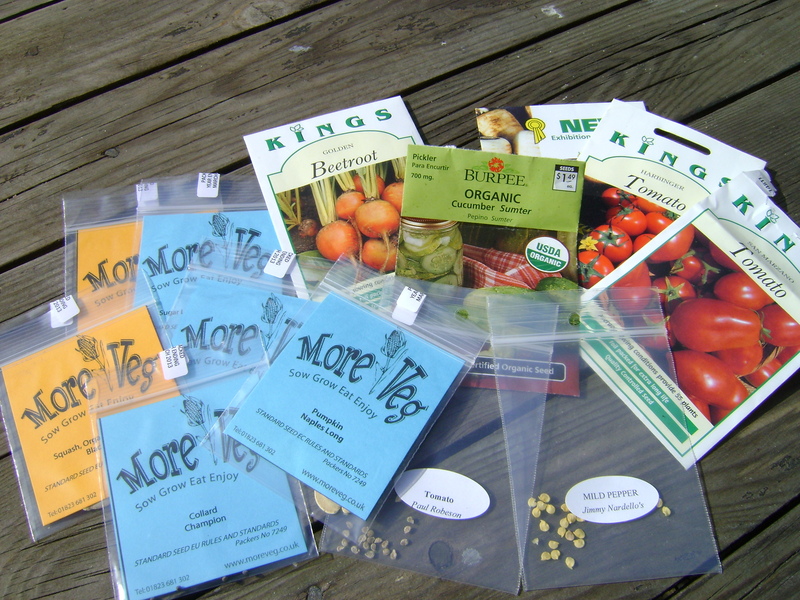 I have chosen to grow different tomato varieties this year, a twitter pal has started a lovely heirloom seed company The Art of Seed so I was interested to try some of her heirloom seeds, I chose Paul Robeson tomatoes and Jimmy Nardello pepper seeds. Some of these vegetables will stay with me in my garden where I can keep a better eye on them, others when they get big enough will travel to Kent to my Mother in laws allotment. For now they are in my bedrooms, some growing quite big but as we are having a very wet and cold Spring they can’t go out yet. Thanks to this challenge I am growing both more than usual and new vegetables! I cant wait to see how they all do! 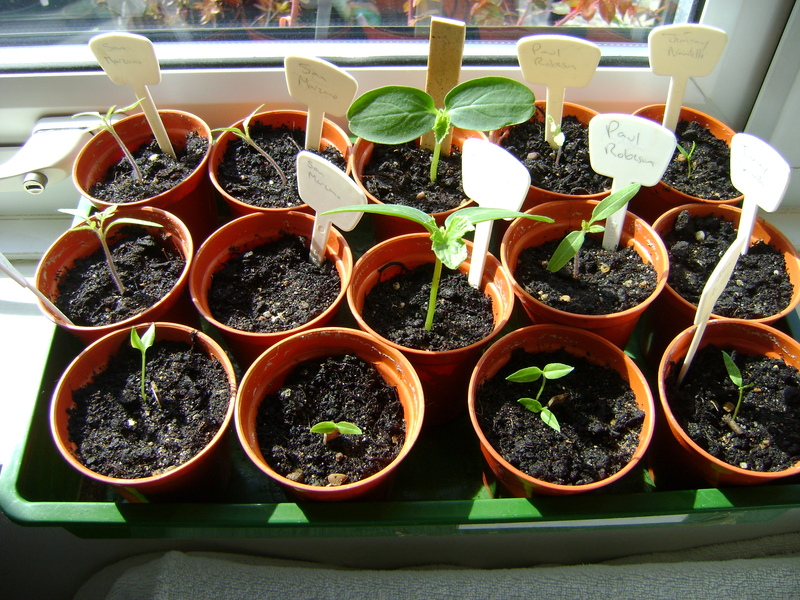 Some of those seedlings now! You are currently browsing the archives for the Urban Farm Challenge category.